When you start with a strong foundation, you can go anywhere and do well. Starting as early as possible, with an amazing education is key. We both believe that to the core. When James and Sarah Heck decided to participate in The Peck Promise Campaign, a naming opportunity in the Deetjen Kindergarten seemed a perfect fit. Then, four years later, son Joseph made a similar endorsement when he announced he would refuse to smile during his last month of kindergarten because he was so sad the school year was drawing to a close. This was the same Joseph who, one year prior, asked permission to drop out of preschool to start at Peck after witnessing his older sister’s passion for school. Watching their children fall in love with learning at the very beginning of their formal education was a dream come true. The Hecks are true believers in the value of the K-to-8 model, and they understand the importance of building a strong foundation in early years. Beyond their strong belief in Peck’s K-to-8 program, the Hecks are supporting the campaign because they are impressed with the school’s evolving master plan. Although the new Peck Commons looms large as the new community hub, there are many subtler aspects of the campaign that impressed them equally. I didn’t expect Peck to be the real family that we discovered. As parents, we’ve made such amazing friends here. Everybody feels like they are in this together. Everybody puts 110 percent into everything here. Yes, we pay tuition. But I feel like we’ve gotten so much more out of it than what we put in. The teachers, the parents, everyone makes us feel like we’ve become part of this amazing family and you want to make it as good as it can be for whomever comes next. That desire to make the world a better place extends beyond just the Peck family and community. 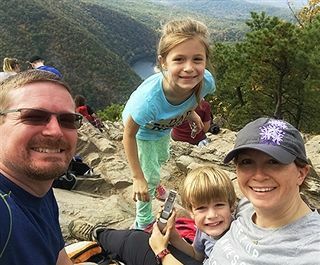 Both Sarah and James work closely with technology, but they have a commitment to breaking away, getting their kids into the wider world, and out of their comfort zones. They enjoy the outdoors, hiking, fishing, and even spent last spring break trekking into a section of the Grand Canyon. The Peck Kindergarten underwent a transformation last year in the early phase of the campus master plan. The design took its inspiration from a garden and the colors and palette reflect that theme. This was intentional because Kindergarten at Peck is where the original seed is planted – a seed that blossoms and transforms itself throughout the kindergarten to eighth grade journey. How fitting that the Heck family, with their passion for early learning, growth, and nature, chose this wonderful kindergarten space as a symbol for their commitment to The Peck Promise Campaign. Questions? To find out how you can be part of The Peck Promise Campaign, contact Lauren Spirig, Campaign Director, at 973-539-8660 x135 or lspirig@peckschool.org.